Lángos is one of the, if not the, most popular street foods in Hungary, and though it's basically a lot like fry bread, there are some important differences between the two. 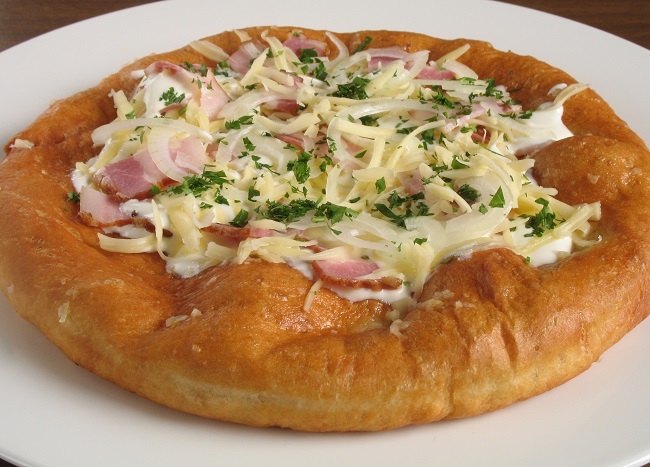 Most often, it is garnished with garlic, sour cream and cheese, but you may consume it with any kind of topping you like. It takes approximately 110 minutes to get ready with the breads. To make the garlic topping, first grade the peeled garlic cloves, or puree them with a food processor. Put the water, salt and oil into a glass, jar or small bowl, and combine them. Add in the garlic puree or graded garlic, and stir them together. It's best if you put it into the fridge for at least 30 minutes. First, warm up the milk and stir in the sugar. Dissolve the yeast in the milk, setting it aside for 15-20 minutes, or until it becomes bubbly. Place the flour into a big bowl, then add the salt, the yeast mixture and the oil. While forming the dough, add water in gradually. When the dough is not sticking to the bowl anymore and is soft, no more water is needed. Wrap the bowl with a towel, then set aside for 30-40 minutes, preferably to a warm place. After you let the dough rest, form ten balls, and let them rest for another 30 minutes. Flatten the balls into disks, then fry them in oil. Soon as the breads are ready, brush some of the garlic topping onto them. This is followed by a layer of sour cream, then finally garnish your lángos with graded cheese.